Tart Restaurant in the Fairfax district is part of the revamped and refurbished Farmers Daughter Hotel that is paying homage to its rather seedy and chequered past when it attracted a lot of Hollywood actors and insiders looking for a good time. These days, younger Hollywood comes on the weekend for the soon to be legendary brunch, where if you jump into the swimming pool fully clothed, you get half off your bill. If you do this insane feat five times, you get your name inscribed on a plaque in the restaurant, and yes there have been plenty of takers. The style of food at Tart can loosely be described as a cross between Southern and French with some British touches thrown in for good measure. The Chef in charge is Keith Shutta, a Torrance native who has an extensive local resume including Shutters at the Beach. He loves his job working from a tiny kitchen, and he seems to be given a great amount of rope from the manager and the owners. At Tart, which in England means either a cake or dessert, usually with custard or a loose woman with little or no sexual morals, Shutta has created a very eclectic menu. You must start with pigs ears ($7) which are first boiled for three hours to get rid of any impurities, sliced and smothered in corn starch and then fried. They are served with Tabasco, grilled lime and celery and ranch dressing and it’s a real treat. I will definitely be back for more. Other appealing appetizers that I did not try include Hush puppies with maple syrup dip ($6), Crab avocado toasts with lemon and hot sauce ($7) and the smoked trout deviled eggs ($6). I did try the House made Jar of pickles ($5), a tasty selection of baby pickles of all kinds. 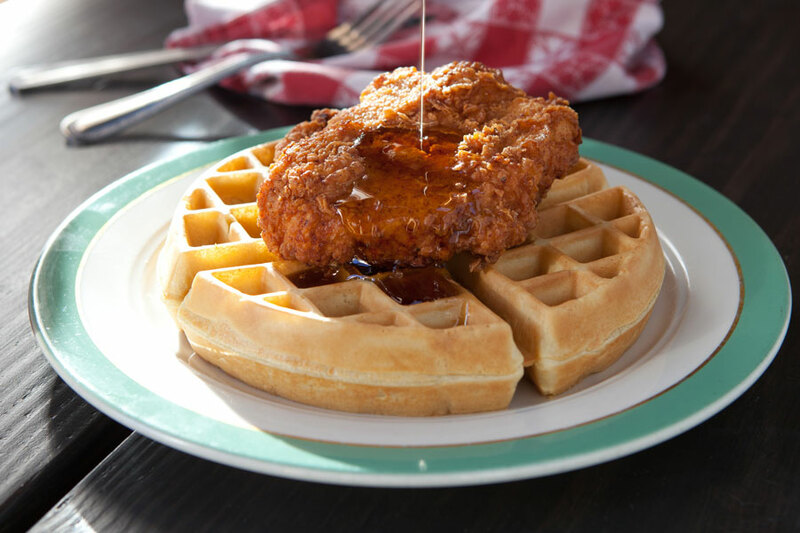 What is a must try as is the signature dish of chicken and waffles ($11), with the tenderest fowl I have ever tried. It is of course buttermilk fried and comes with a Tabasco-maple butter. Another shared dish on the menu which will change depending on the season and the whim of the chef is the Pork Belly with black-eyed peas and mustard greens ($13). Fish and Chips is not done with the standard Icelandic Cod, the Tart version is done with catfish and it works. It is served with mashed green peas, tartar sauce and malt vinegar powder for a giveaway price of $16. The cocktail list at Tart features nine different specialty drinks all priced at around $13 with a possible standout being the Smoky Paloma, a potent mix of Epsilon Tequila, El Silencio Mezcal, Agave Nectar, Lime, Grapefruit Juice, Serrano Peppers and Egg Whites. An even bigger deal especially during the weekend brunches are the punch bowls at $55 for a full bowl and $35 for a half bowl. With six different bowls to choose from including the above named Tequila, a good time is ensured by all.